The suspect being held after an attempted terror attack at New York City's main bus terminal has said it was in retaliation for US attacks on so-called Islamic State, US media say. 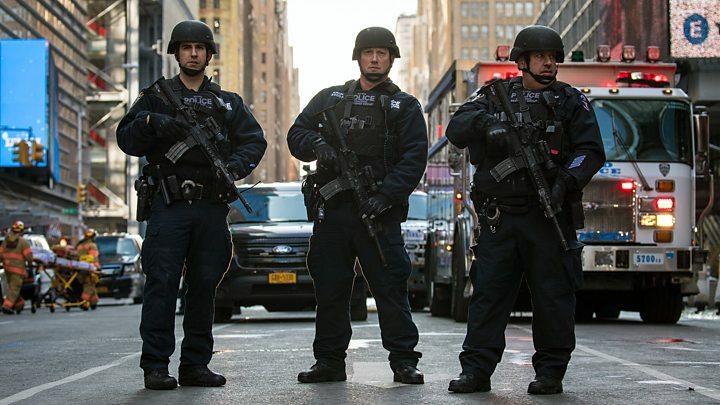 Akayed Ullah, a 27-year-old Bangladeshi immigrant, was injured when a "low-tech explosive device" went off at the Port Authority terminal in Manhattan. The suspect's home in the New York City borough of Brooklyn is being searched. Neighbours tell the New York Times that they heard the sounds of "big fighting" coming from the home on Sunday night, the day before the attack. The Bangladeshi government says he had no criminal record in the country, which he last visited in September to see his wife whom he married two years ago. The visit lasted about six weeks, his uncle told the Associated Press, adding that Mr Ullah has a six-month old child with her. Mr Ullah's wife, who did not join him in the US, and other family members are now being questioned to try to understand how he was radicalised. 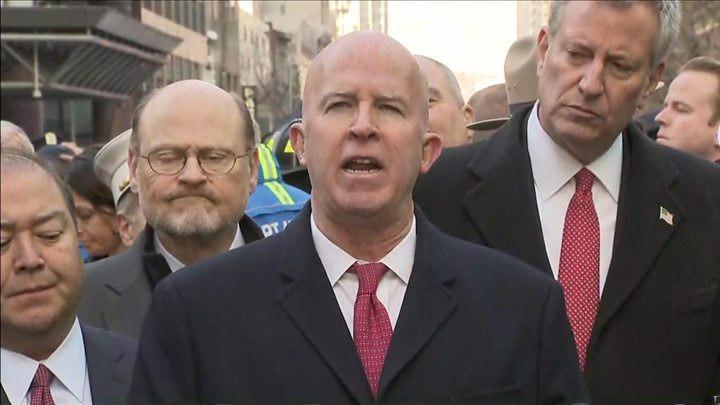 Media captionNYC police commissioner: "Suspect has burns and wounds to body"
Mr Ullah is believed to have acted alone in Monday's attack, Mayor De Blasio said. US President Donald Trump has said Monday's attack, which followed a terror attack in Manhattan in October that killed eight people, "highlights the urgent need... to enact legislative reforms to protect the American people". "America must fix its lax immigration system, which allows far too many dangerous, inadequately vetted people to access our country," Mr Trump added. Earlier, White House spokeswoman Sarah Sanders said that if Mr Trump's proposed immigration crackdown had already been in place, "the attacker would have never been allowed to come into the country". Another eyewitness, Alicja Wlodkowski, told Reuters news agency she had seen a group of about 60 people running: "A woman fell. And nobody even went to stop and help her because the panic was so scary."